GeneaWebinars: REMINDER: FREE Irish Genealogy Research Live Q&A - TOMORROW, Thursday, May 31st! 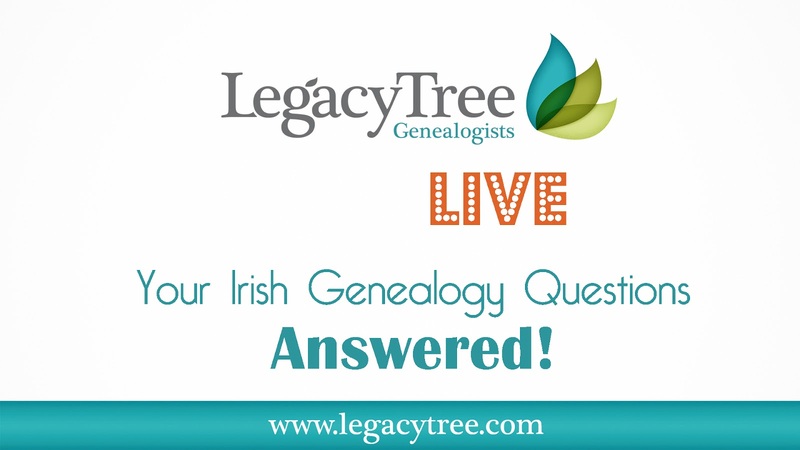 REMINDER: FREE Irish Genealogy Research Live Q&A - TOMORROW, Thursday, May 31st! If you have Irish ancestry, you are likely aware of the challenges that tracing your Irish genealogy can involve! Don't worry--you're not alone, and we want to help! Legacy Tree Genealogists will be hosting a LIVE Q&A all about Irish family history research on our Facebook page where our resident Irish expert, KJ Eakman, will be answering questions users submit on our website at https://legacytree.com/live. We will also be accepting questions live during the broadcast, so be sure to join us! Thursday, 31 May at 7:30 p.m. MDT. We'll also share the broadcast on our YouTube channel. Subscribe here.